There is a lot of information explaining how to start beekeeping both on the internet, and available in books. On this site, you’ll find some useful introductory information, as well as links to more in-depth sources. 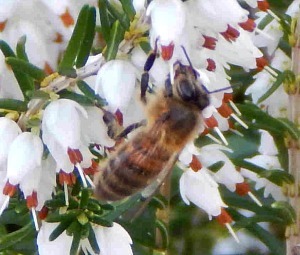 There are also free items to download and use, including a beekeeping book and bee hive plans. The audience for this website is very varied, but hopefully there will be something to suit you. You don't need to go out and buy every gadget, but here are some useful things for you to have. Considerations for keeping bees in the town or city. First decide on the approach you wish to take. This will determine how you equip yourself with beekeeping supplies. Advice about purchasing second hand beekeeping equipment and supplies, including how to clean it. If you are about to start beekeeping, perhaps you will be given a swarm. If not, you will have to purchase some bees to start off. Tips shared by other beekeepers. This is a growing movement. It focuses on beekeeping in a way that supports the natural behaviours of the honey bee (such as how the bees naturally build honeycombs). This approach uses natural methods of dealing with issues such as varroa. Here you will also find a free book to download. Background information on Varroa mite (or Varroa Destructor). There is a link to treatments, including non-synthetic, natural options and a study to download. Bee hives are expensive. Download free plans to make your own beehive. Several versions to choose from. Recipes for fondant and syrup for the times when your honey bees need to be fed. If you want to know how to start beekeeping, why not take a look at this range of great beekeeping videos showing Natural Beekeeping in action. You can always take a look at them again later. Brief descriptions of terms used in beekeeping. Take a look as some of the issues around honey bee deaths.